First, the players must agree on how large of a map they wish to play on. The starter set comes with 7 interlocking map tiles (also called Map Sections). You can play a game with as few as 4 Map Sections, or as many Map Sections as you have. Additional Map Sections can be bought by adding additional starter sets to your game. There are 4 distinct sets of Map Sections available in starter sets, and you may play with as many tiles in a game as you wish. Keep in mind, that the more Map Sections you play with, the longer the game will last. Next, each player selects the cards they will be using for the game. Each deck must have at least 40 cards in it. The maximum number of cards in your deck is based on the number of Map Sections you are playing with. 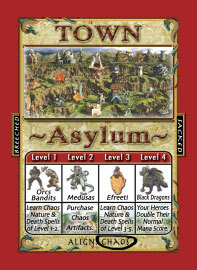 Each player can have 10 cards in his deck for each Map Section used to build the game map. 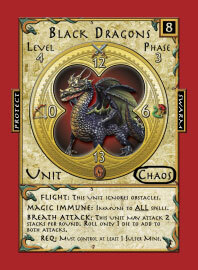 Any combination of cards can be used as long as you include the units required as your “starting forces”. Your starting forces include 1 Hero, 1 Town, 3 level 1 Units, 2 level 2 Units, and 1 level 3 Units. These cards must all have the same Alignment. Look at the 3 cards shown below. 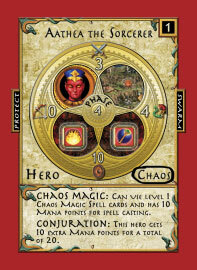 In the diagram, we have circled the alignment as it appears on each card type. Remove these cards from your deck and place the town card on the table face up. Then, place the remaining cards from your starting forces in a stack, making sure that the Hero Card is on top. A group of unit cards under your control is referred to as an Army Stack. Shuffle the rest of your cards, and place your deck aside face down. This will be the deck you will use in the game. There will be a discard stack face up next to your deck during the game. When you run out of cards, you will shuffle your discard stack and reuse it.